Nobody’s proud of watching reality television. Few will admit it, but some of us must be watching this multi-million dollar television industry. So what’s your show of choice? Do you like to get groovy with Dancing With The Stars (which earns an estimated $2.7 million per 30 minutes of airtime), or would you rather see whatever the latest freakish talent being showcased on The X Factor ($5.5 million)? Do you prefer to stick with the classics like American Idol ($6.5 million)? Whether you’re watching the backstabbing antics of Big Brother or—heaven forbid—Keeping Up With the Kardashians, statistically speaking, there’s a pretty good chance one of these shows is your guilty pleasure. The guiltiest pleasure of all just might have been a little show on the A&E network called Billy the Exterminator. It was one of the network’s flagship reality television programs that preceded the mega-hit Duck Dynasty, and many viewers were first introduced to the show with a brief, 20-second trailer advertisement which featured a gentleman wearing a mesh shirt and dark shades. No, he wasn’t headed into a progressive nightclub, he was laying in the dirt and covered in cockroaches—then the announcer promises that the show will be “full of surprises,” whereupon a cockroach climbs out of the man’s mouth. Meet Billy Bretherton, a man who made his television debut on the reality television series Dirty Jobs. Apparently his job as an “expert pest control man” was dirty enough—and entertaining enough—to warrant his own series. A former member of the United States Air Force, Billy is quite the character with his unique (read: bizarre) goth-cowboy fashion sense and boisterous personality. Though some fans of the show might argue that the real stars were his family members and employees. His dad, “Big” Bill is especially fun, and his mom/dispatcher Donnie keeps him busy in each episode. And please just admit it to yourself: when one of the recurring members of the cast is a “Licensed Gator Hunter,” the idea of changing the channel becomes strangely difficult. Sadly, his ex-wife could only handle the rigors of a reality television gig for a handful of episodes. Speaking of episodes, A&E produced eighty-eight of these puppies. The show was originally titled The Exterminators for the first season, but the showrunners must have realized that Billy Bretherton is what made it worth watching, not the exterminating. Having said that, each episode typically involves Billy exterminating some kind of pest—ranging from the aforementioned cockroaches to alligators. Occasionally, Billy and the crew would show the audience helpful tips with how to deal with a variety of wildlife, including allowing himself to be attacked by a 250 pound wolf… while holding a chunk of meat in his hand. And those are really the moments that keep us coming back to reality television—the bickering and probably-semi-scripted drama and confrontations between the “characters” are fun, but what most of us really want to see is an edgy southern goth cowboy who looks like he belongs in the background of a Kid Rock music video being viciously mauled by wild animals. Or is that just us? Despite his career in the military and one-time dream of becoming a member of law enforcement, it appeared that Billy and co. had a bit of a penchant for the wacky tobacky. You know, the devil’s lettuce. Purple Urkel. The good-good. What we’re saying is that Billy and his wife Mary were busted in a Marriott Hotel for possession of marijuana. Actually, to be more accurate, they were caught with synthetic cannabinoids, which is sort-of-but-not similar to pot. Regardless, these substances (usually made with something called cannabicyclohexanol) are ridiculously illegal in Louisiana. After peacefully surrendering, the couple were charged with possession of a Schedule I Controlled Dangerous Substance and possession of drug paraphernalia. If you were one of the many people that watched the show regularly, none of this came as a huge surprise. Sad, though, because it did result in the end of a rather fun slice of reality television history. So, what can fans do now to get their fix of exterminatin’ goodness? The good news is that the Bretherton boys are far from done with their entertainment careers. 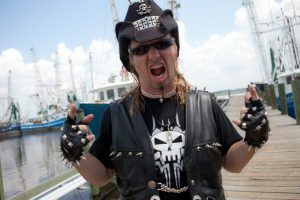 Ricky Bretherton, Billy’s brother and regular on Billy the Exterminator, produced a web series available on YouTube called Vexcon The Exterminators, with each episode ranging seven to eight minutes. The short yet entertaining series features a variety of familiar creatures to keep your pest-programming going (for a little while, anyway), including wasps, bees, bats, cats, and more critters like a ridiculously cute—but perpetually angry—raccoon that decided to make his home in a gentleman’s garage. And what about Billy the Exterminator himself? Rumor has it that the Terror of Termites will be launching a new show based out of Canada (a country where, interestingly, synthetic cannabinoids have not been completely outlawed), but details are sparse at the time of this writing. While many TV fans cast “blame” on the likes of Joe Rogan—of disgusting Fear Factor notoriety—or MTV’s more-profitable-than-actual-music The Real World for the inception of reality TV’s popularity in the United States, the reality is that these shows kinds of shows have been around for decades. Seriously, if you can get your hands on a surviving episode of An American Family, watch it. It was a reality TV show from the 1970s that showcased the inner lives of several families from different areas of the country, and watching it now is utterly bizarre. For a taste of more recent reality television, grab the DVD set of Billy the Exterminator or catch a stream of the show on A&E’s website. Just don’t tell anyone how much you like it.